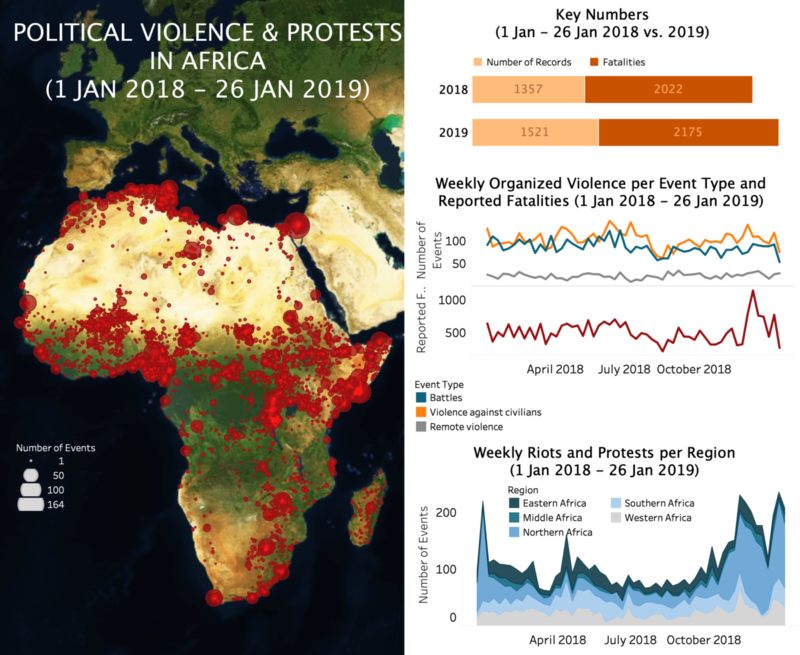 Key developments in Africa in the week of January 20th include the multilayered violence in the DRC and CAR, the deadliest attack on UN forces in Mali to date amidst rising JNIM activity in the country and in the region, and the large-scale protests that rocked Tunisia. The Democratic Republic of Congo (DRC) and the Central African Republic (CAR) were among the most active countries in Africa last week. In the DRC, fighting surged in the Masisi territory (Nord-Kivu province). Militias fought for territorial control between January 19-26th, leaving at least 35 killed. The clashes involved members of the Renewal faction of the Nduma Defence of Congo (NDC-R), the Alliance of Patriots for a Free and Sovereign Congo (APCLS) as well as factions of the Mayi Mayi Nyatura. Meanwhile, the government announced key gains against the Democratic Forces for the Liberation of Rwanda (FDLR) in operations in Faringa in Rutshuru and Rubaya in Masisi over January 9th-23rd; as well as against the National Council for Renewal and Democracy (CNRD) – a splinter faction of the FDLR – on January 18th in Masisi. This was the first reported event involving the CNRD since September 2018. Further north, around Beni, the Congolese and international forces remain key targets. On January 21st, the Allied Democratic Forces (ADF) attacked the FARDC in Mapou (Oicha) and on the 23rd, the Union of Patriots for the Liberation of Congo (UPLC) abducted three MONUSCO soldiers in Kisalala (Butembo). Over the summer of 2018, the UPLC had been reportedly operating alongside the ADF and Mayi Mayi factions in this area. In CAR, violence rose ahead of a gathering of the leaders of 14 armed factions to negotiate a new peace agreement in Khartoum, Sudan. As forces of the Union for Peace in the Central African Republic (UPC) – one of the most active of these armed factions – lost grounds in Bakouma (Mbomou prefecture) against the military and MINUSCA forces on January 16th, they launched new attacks in Bambari (Ouaka). On January 19th, after killing a humanitarian worker and a teacher in the town, they clashed with the MINUSCA forces. Four days later, they targeted the MINUSCA forces with a rocket, leading to clashes that left another three civilians dead. Not far from Bambari, in Ippy, a drunken UPC soldier also opened fire on civilians at a funeral, killing 13 civilians. His commander executed him the next day. Meanwhile, forces of the Return, Reclamation and Rehabilitation (3R) killed 13 people in Zaoro Sangou (Mambere-Kadei) on January 20th. These developments underline key challenges in the new bid to forge peace in the CAR. In hosting the talks four months after successful negotiations to resolve the conflict in South Sudan, Khartoum is asserting itself as a strategic conflict resolution actor in the region. Yet, the talks are held at a tumultuous time for Sudan. Anti-government protests have entered their sixth week last week and continue to be heavily repressed by the security forces: two new fatalities reported on January 24th brought the total fatalities in riots and protests since December 16th to nearly 40. One other key development last week in Africa was the complex attack against the MINUSMA forces on January 20th in Mali’s Aguelhok (Kidal region). The complex attack, initiated by a suicide car bomb and followed by an armed assault, was claimed by militants of the Group for Support of Islam and Muslims (JNIM), who condemned the normalisation of relations between Chad and Israel – reminiscent of the language used by Al Shabaab gunmen in the attack in Kenya’s Nairobi the week prior. JNIM’s attack left 10 peacekeepers killed and 25 wounded, as well as three assailants killed. This was the deadliest attack ever recorded against the UN contingent. A few days later, IEDs likely laid by JNIM combatants struck two MINUSMA convoys in the Douentza area (Mopti), leaving another two peacekeepers killed and seven others injured. The events reflect a significant increase in the JNIM activity in Mali and in bordering Burkina Faso and Niger over recent months. In Mali, events involving the group went from four in September 2018 to 26 in December 2018, prompting new combined air and ground operations by joint Malian and French forces at the beginning of January 2019. Noteworthy last week in Africa were lastly the large-scale protests that rocked Tunisia after the breakdown of talks between the government and the country’s general labour union (UGTT) over salary increases in the public sector. Preparatory and secondary school teachers, who have been protesting since December for wage increases and educational reforms, announced an open-ended strike after the breakdown on January 17th, pushing thousands of students into the streets nationwide. At least 80 riots and protests have been reported across the country between January 18-26th, mostly led by students, students’ parents and teachers, with the security forces intervening in only a handful of cases. The demonstrations reflect a growing social malaise in Tunisia amidst hardening economic conditions.